Time travel has been discovered. Now you can go into the past, fight injustices, and craft a better future. Or you can go back in time and make sure that when time travel is discovered, you are in control of it and the world. Temporum is a time-travel resource-management game for two to five players. Players seek to advance all their influence (crowns) from the past (Zone 1) to the futuristic present (Zone 4). The first player to do so wins. To start, ten zone cards are placed on the board–one in Zone 1, two in Zone 2, three in Zone 3, and four in Zone 4 (these represent the real and possible alternate time lines, and the cards match the zone number). The clock arrows (indicating which time line is active) are placed on the bright paths leading from one card to another, and the player pawns are placed on the real Zone 4. Each player places ten influence crowns in Zone 1 on the score track. Each player is dealt two player cards, and players are given starting money according to seating order. The game setup for three players. Zones have abilities that allow players to play, draw, or score cards, and many offer benefits to the player who “rules” (has the most influence in) a zone. Each player card offers players an amount of money when played, along with an ability (either an ongoing ability or a one-time ability). Each player card also has a scoring condition, offering players an opportunity to advance their crowns a certain number of moves in line with the amount paid. Once one player advances all his or her crowns to Zone 4, the game ends in victory for that player. The players on the start card in Temporum. The player pieces are cut in both male and female shapes. Time Travel, or Time Stands Still? I loved Dominion. I still do. But it has got to be difficult for a designer to lead with such a great game, because all future games will be compared to it. Not that Donald X. Vaccarino has to care very much about reviewers commenting on how his other games compare to Dominion, having been awarded the Spiel des Jahres twice (!) and having released lauded expansions for his games at a galloping pace. But whether the comparison is merited or not, I always think of Donald X’s games first in their relation to Dominion. 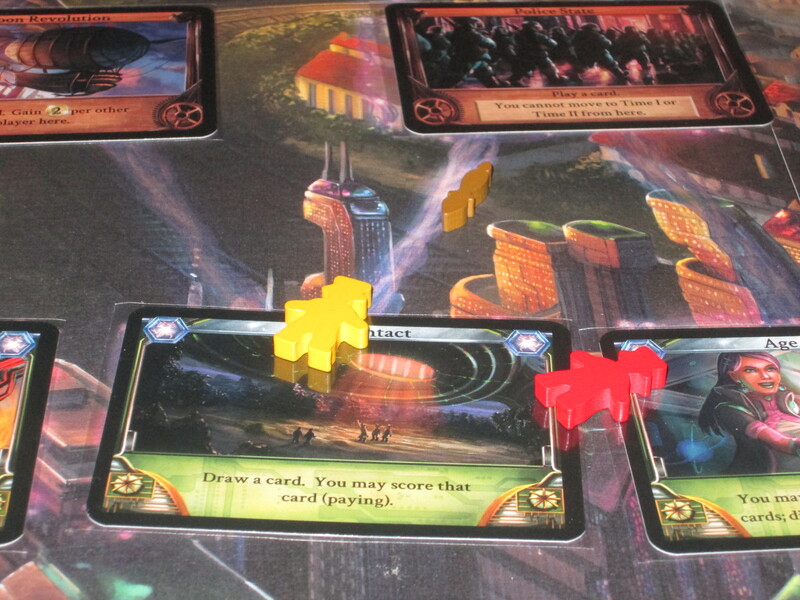 And Temporum is the first of his post-Dominion games that I’ve thought shows promise. Temporum comes with 40 different zone cards, ensuring that each game is different from the last. Temporum is similar to Dominion: it’s a race, and the goal is achieved through hitting levers more efficiently than your opponents. Whereas Dominion offered individual levers in the form of cards entering personal decks that each player controls, the levers in Temporum are all public, and players can limit access to the levers other players need. I’ve heard various criticisms of Temporum that the zone cards are too similar and thus uninteresting, but to me the fun of the game is making the most of subtle differences. Sure, all Zone 3 cards allow you to play a card upon visiting them, but they can do drastically different things afterward. For example, the Police State locks players from traveling backward in time from that zone, making it lucrative for other players to keep you there. (The most fun game of Temporum I’ve played had all of us funneling Zone 2 into the Police State and trying desperately to claw our way out of it.) The Prohibition Era and many other cards grant bonuses to the player who rules there. If you rule, you want to manipulate the flow of time for your benefit. If you don’t, you want to choose the least helpful option for the ruling player. The subtle differences in zone powers make Temporum an efficiency game more than anything, but it’s fun to manipulate the puzzle in your favor. Another interesting aspect of the game is that because benefits often accrue to the player who rules a zone, players want to advance their crowns strategically so as to exploit the benefits of the most zones. One Zone 1 card, for example, reduces the cost of scoring a card for each zone a player rules. Spreading influence around thus might be a good bet, as long as you can rule the zones where you are. (Of course, much like Innovation, built into many of the “ruling” zone cards is planned obsolescence: move too many crowns into the win zone, and you won’t rule the other zones, reducing the benefits you get from those cards.) It’s fun and tricky to spread your influence for greatest effect. There are lots of decisions to weigh in Temporum, and that is one of its strengths. As I mentioned, balancing where you have influence is one of the key decision points of the game. You must also balance your player cards. Cards come in two types–offering immediate or ongoing effects–and while the immediate cards offer some benefit, well, immediately, and generally offer a higher payout in a lump sum, the ongoing cards can be a boon if the game lasts several turns more. The ongoing cards are the only way to create an engine, really, so players have to balance “wasting” a turn to play them (because they don’t offer much initially) with the long-term benefits they might offer. It’s usually worth it to play an ongoing-effect card, but it doesn’t always feel like it (and, indeed, these cards are better at the beginning of the game since they offer more benefits over time). There is the further balance of playing a card for its benefit or using it to score. While this isn’t the most compelling decision (see below), there have been times where I’ve had to ditch a good card in order to stay competitive in the game. 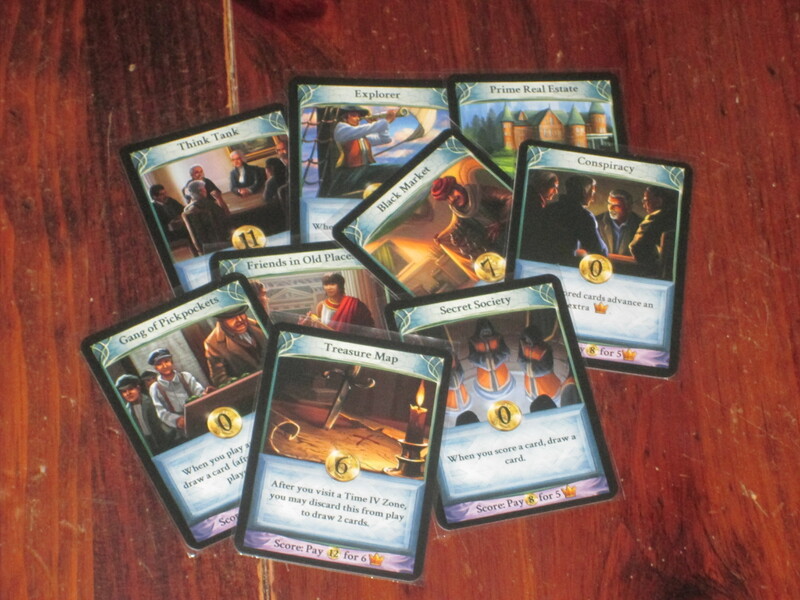 Some of the player cards in Temporum. I love the flavor on these. 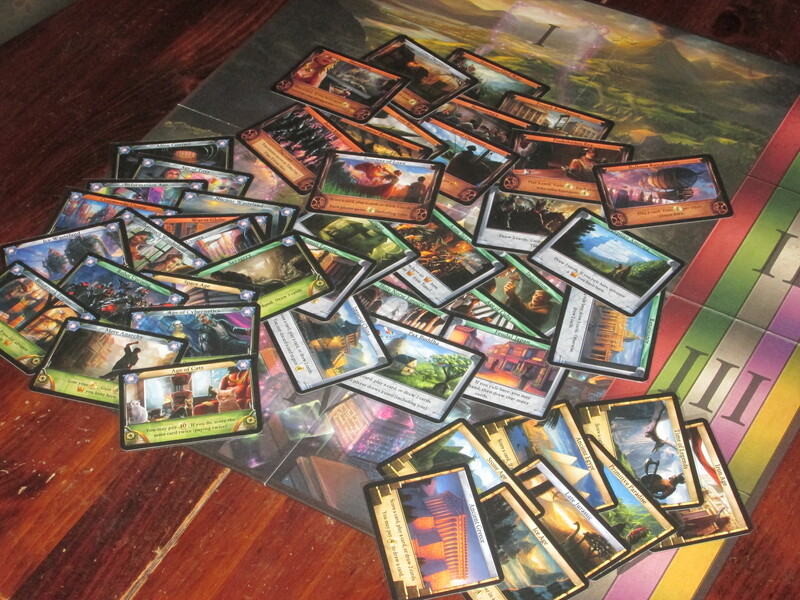 I also really like the thematic flavor of Temporum. While it doesn’t have the story-driven elements that excite the more RPG-inclined gamers among us, Temporum does have some great window dressings. The money tokens are a subtle dose of theme, with the currency advancing through time as it advances through denominations. (The 1s are seashells, the 2s are coins, the 5s are paper money, and the 10s are digital currency–BitCoin, if you will.) The player cards, while abstract in how they interact with the overall game, are nods to various time-travel tropes. The “Step on a Butterfly” card, for example, changes time in every zone from top to bottom. There’s a card called “Kill Your Grandfather,” and another called “Predict the Future” that shows Jimmy Hendrix performing while someone is holding a newspaper announcing his untimely death. Further, the zone cards, while being abstract in the sense that they offer very gamey things to do (score, draw, play cards), also acknowledge some of the wacky things that might happen in an alternate timeline (or in the future). There’s the “Holy Norse Empire” in Zone 2, and we may potentially see “The Age of Cats” in the future. Or the world may end in a “Nuclear Wasteland.” The game doesn’t have a strong story element, but it’s there if you want it to be, and I like the conceit of the game. Some more player cards. The blue background ones are worth less when played but have an ongoing effect for the player. Temporum is super easy to teach. The game board is clear (with the exception of the arrows–see below), and it’s easy to read the game state. The terminology in the game is consistent, and the rulebook has answered all the questions I’ve had about the game. (It’s surprising to see so many rule threads on BGG–really, the game is well explained in the rulebook and the cards.) Temporum can be taught in five minutes or so, which is a huge boon for lunchtime gaming. 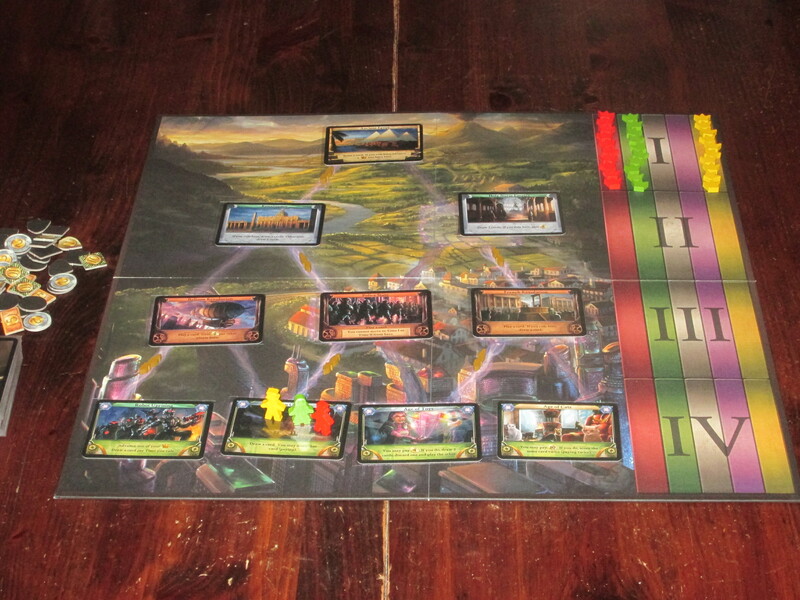 The Temporum box says the game is for two to five players in 45 minutes. The time estimate is pretty accurate (unless you play with deliberate players), although for my taste, I prefer the game with two to three players. There’s not a lot you can do on another player’s turn, and while occasionally things they do to you will matter (especially if they make you lose money or drastically alter the time line), the main fun of the game happens when you get to do stuff. With four or five players, it takes more time to come around to your turn, and I find that the downtime drags on longer than I’d like. There are a few aspects of Temporum I’m not so keen on. The first is the luck of the draw with regard to player cards. There are two copies of each player card included in the deck, and some just seem much better than others. (Although, I suppose, each one is situationally useful.) Also, for as powerful as the blue ongoing-effect cards are, they are not always evenly distributed. There have been games where a player claims not to have drawn one all game, or where one player draws all of them (resulting in a not very close contest). Obviously, this isn’t Dominion, where all players have equal access to player cards, but the randomness here is noticeable, and I’m not keen on players blaming (sometimes legitimately) unluck of the draw for their loss. The chief offenders seem to be the ongoing-effect cards that let you draw more cards. Those are very powerful, as they can help you streamline the process of visiting zones, cutting out one step of the draw-play-score formula. 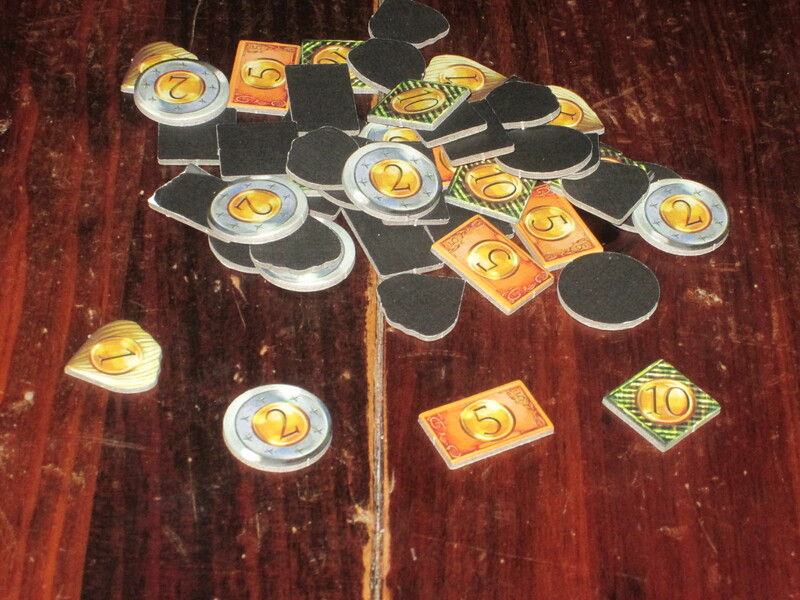 The money tokens in Temporum are thematic, advancing through time as they advance through denominations, but they are one-sided, which is disappointing. I’m also not keen on all of the zone cards. Namely, I’m not keen on the zone cards for each age that offer players a choice between scoring, drawing, or playing cards. The reason I’m not keen on these is that there’s not much reason to leave these cards and travel through time. These cards are a kind of one-stop shop that makes the game boring to play. After one particularly boring game that included these zones, we stopped allowing them into our random setups. And, finally, I wish the decision to play or score a card was more interesting. If there’s a method to the scoring condition for each card, I haven’t found it. What makes Race for the Galaxy, Glory to Rome, and other games that offer multiple uses for cards so compelling is that it is often a grueling choice whether to play a card for its benefit or to play it to pay for something else. In Temporum, I’m not sure there’s a correlation between the relative strength of a card and its scoring condition. The choice in any given hand of which cards to play and which cards to score isn’t usually all that compelling, which is unfortunate: this seems like it could have been a larger decision space. Perhaps in an expansion. The wooden pieces are cool, but they are a little thin and tip easily. Similarly, the arrows used to chart the real timeline are hard to see on the board. Base game replayability for Temporum is average. You get forty zone cards in the box, of which only ten are used each game, although, as mentioned before, the zone cards for Zones 1-3 are fairly similar (Zone 1s always score, Zone 2s always draw, Zone 3s always play cards). While the subtle differences in the cards are fun to exploit in the game, the zone cards don’t offer the variety that, say, even base-game Dominion offers from game to game. And the player card deck is static, so there’s no real variety there. The subtle changes in zone cards do make each game distinct, although I find when it comes time to play, I don’t have the same excitement of discovery on my mind that I do with some other puzzle games with modular parts. 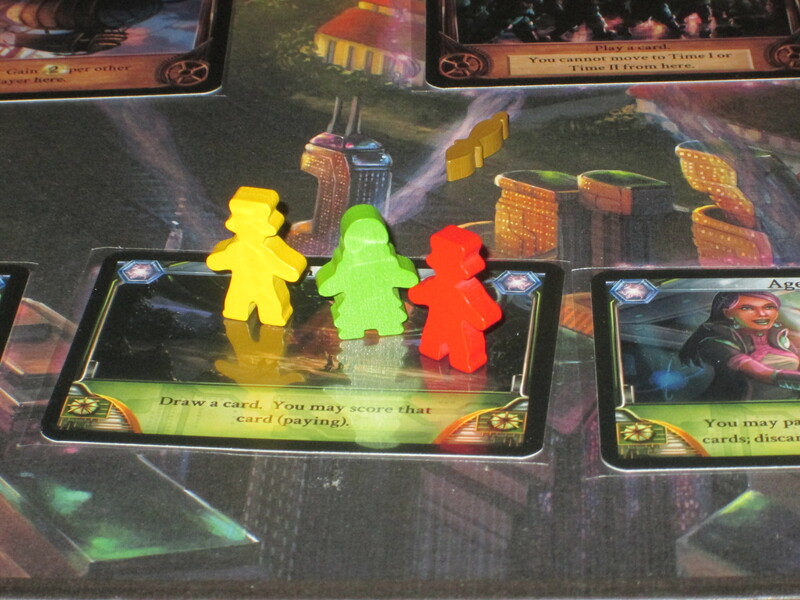 The components in Temporum are serviceable but not great. It seems that what they give with one hand, they take away with the other. 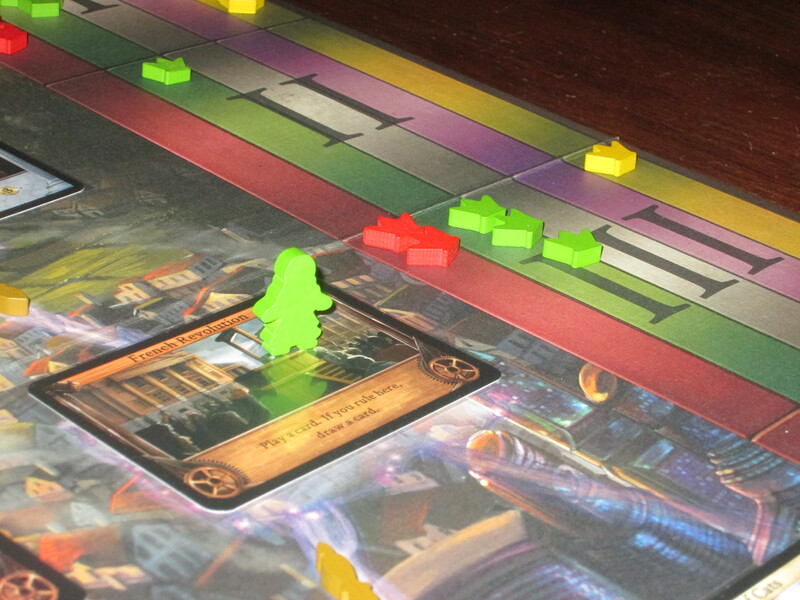 For example, the money in the game is thematic and nicely designed tokens, a cool way to avoid paper money. But the tokens are one-sided, and while each token is a different shape, it’s still a little baffling why only one surface is printed. Similarly, the card art in Temporum is excellent and evocative, but the cards are printed so darkly that it’s hard to see the detail in the provided art, and the cards are flimsy stock. One shuffle through the deck, and I sleeved the cards immediately, already seeing signs of wear on the borders. The wooden pieces are in cool shapes, and the pawns show both male and female bodies in silhouette, but they are small and light, easily tipped. The clock arrows indicating which zones are real are a nice touch, but they are so small and dark that they aren’t that useful. (I usually use player crowns in place of these unless it’s a five-player game.) All told, the components are disappointing. I’d be just fine with this caliber of components if the game bore a $34.99 MSRP, but for a game with a sticker price of $49.99, I frankly expect more. 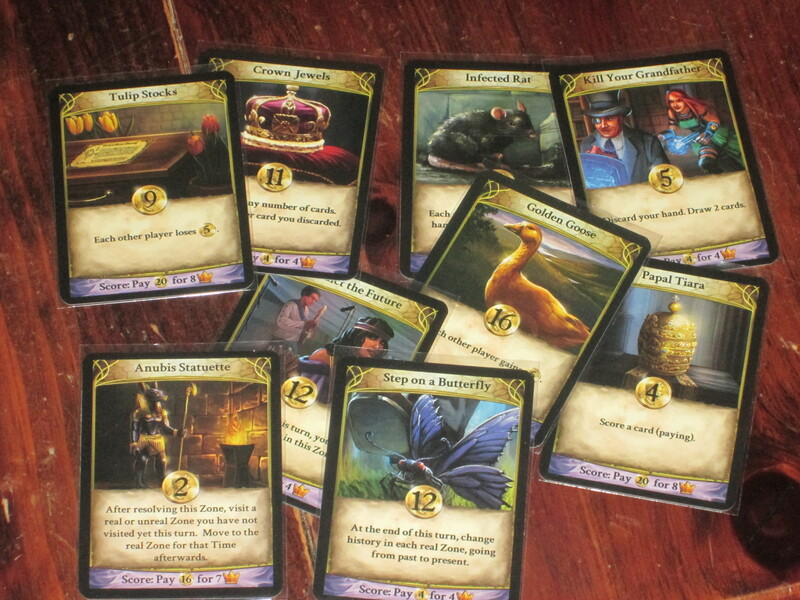 The components in Temporum are…a little sparse. Some cards, wooden pieces, and money tokens. 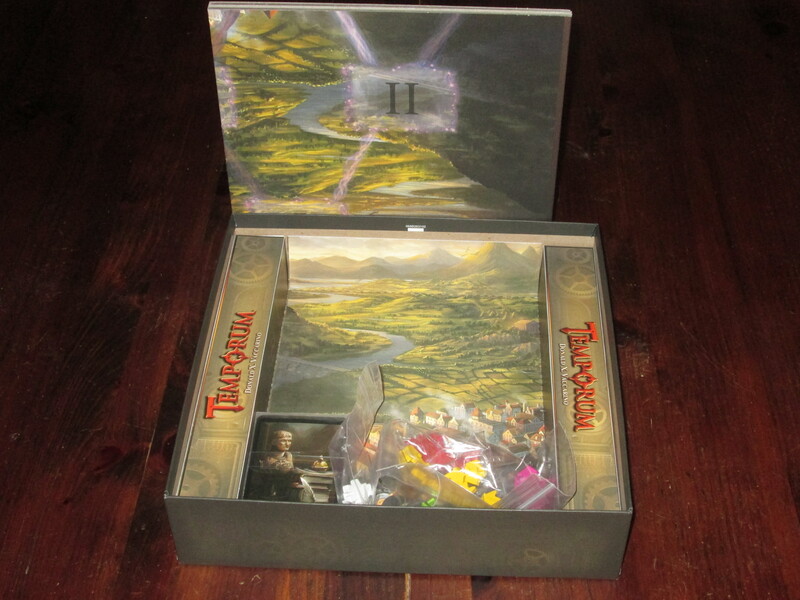 They don’t take up much space in the box, and the board is smaller than the box dimensions and shifts around. The insert looks nice, though. All told, a somewhat disappointing package. Of course, mediocre components are forgivable if the game is good. And Temporum is a good game. It’s an interesting puzzle with lots of considerations to juggle. While I don’t think it’s the best game of its type (both Dominion and Innovation are more dynamic–and replayable–puzzles that offer a similar experience), the theme will cover a multitude of sins for some, and others will find the more public game of time line manipulation more interesting than the personal puzzle that Dominion and the mind-bending puzzle that Innovation offer. Temporum is also simpler, and that goes a long way toward getting people to play. 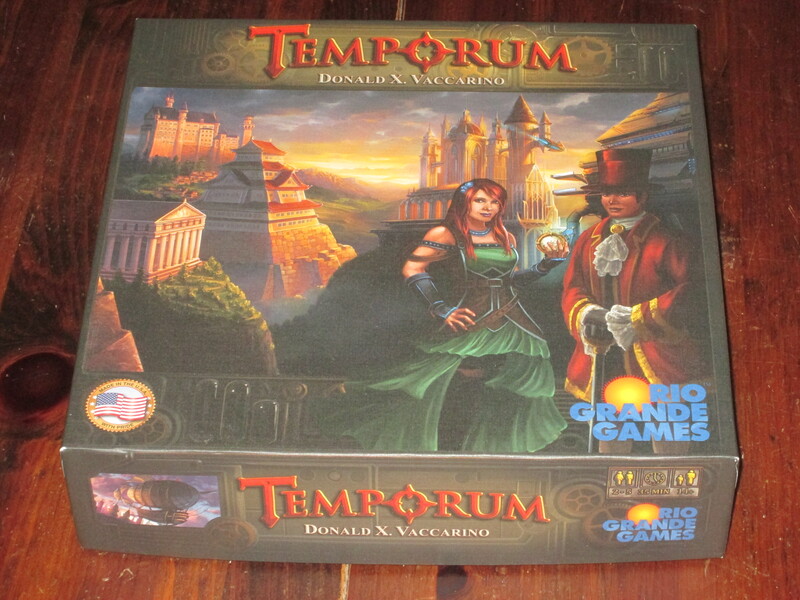 Temporum is a game I like but do not love, and I’m not sure how long it will stick around in my collection. I’m not disappointed I’ve played it, and I’m still willing to play if someone else wants to, but for my taste I will usually choose something else–even that other game by Donald X. Vaccarino.